Ed Richardson and Ted Baynes, two young engineer graduates from the University of British Columbia in Vancouver, were employed by the Townsite Company to lay out the company town Wells. The first buildings to go up were the Townsite Office on Pooley Street and Ed and Mae Richardson's house (they were newly weds). More houses, a school, hospital, church, recreational facilities, hotels, and stores were built by various members of the community and contractors, such as Northey Construction Company of Vancouver and a local firm, Gardner Construction. Garvin Dezell & Sons Company were hired to build various private buildings. Local carpenters were also employed. The driest area on a small round hill was chosen for the location of the business district. Better class houses were built on Bowman Crescent with a view of the mine, while other residential areas were laid out on the flats below Pooley Street, reflecting the social hierarchy of the town. Wells was quickly organized and structured. Tiny, economical 33 x 100' lots kept the town small & compact, which encouraged neighbourliness and a sense of community. All the conveniences of a large city were provided. Power was supplied by the Cariboo Gold Quartz generator by early November 1934 and running water was in service by winter 1935. 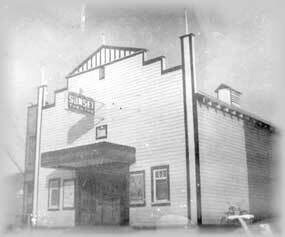 The Sunset Theatre had 'talkies' (movies with sound added) and a large community hall was added in 1937. Wells even had a racetrack and ball park for recreational activities. When the town became a reality by the end of 1934 with 40 buildings finished, it provided financial opportunity for the people who got started there. The boom-town also became the center of cultural and sporting activity in the Cariboo region. People would come from Prince George, Williams Lake, and Quesnel for entertainment and to participate in sporting events. In a 1940 census, Wells was described as the fastest growing town in British Columbia. Since the mines slowly declined after World War II, so the population of Wells steadily dwindled until today there remains around 250 year-round residents. 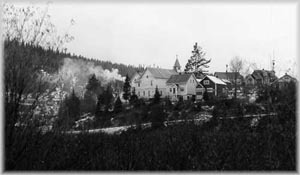 Houses and the hospital were sold privately, the Community Hall was sold to the Wells Chamber of Commerce, and the Wells School is now run by the provincial government. The last mine closed in 1967, and with it, the Townsite Company.